The catalog of 38 special ammunition is vast and includes multiple designs and weights of ball ammunition, civilian self-defense loads, hunting rounds, and tracer ammo issued to our pilots and their air crews so they could signal for rescue after their aircraft went down, as well as many "Specialty Loads" for specific "clandestine" uses. The Fiocchi S&W .38 Special loadings have a vast history that continues today. 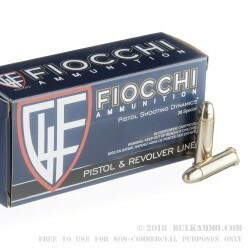 The Fiocchi 130 grain .38 Special rounds are topped with their specific S&W .38 Special bullets. 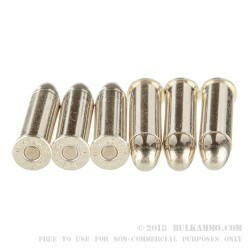 These new, 130 grain, solid lead inner construction with a Full Metal Jacket, brass encased projectile. They are loaded into thick-walled, new, reloadable, non-corrosive Boxer primed, highly-polished, yellow brass cases. These rounds push an impressive muzzle velocity of 950 feet per second, which makes them "Subsonic". In addition to the muzzle velocity, their muzzle energy is a decent 260-foot pounds, which isn't bad for a .38 special. 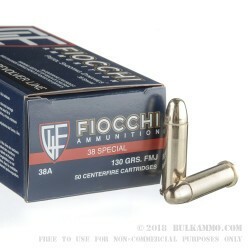 These Fiochhi .38 Special loads are available in smaller 50 round boxes. So, you can choose to really build up your stockpile fast, take your time building it up, or only buy the ammo you need for each trip to the range. Either way, these rounds are perfect for a shooting competition or a cowboy action shooting match, they’re great for shooting your new lever action repeating rifle, trying out that new revolver you just bought, or even an easy day of plinking with your family. Get yours now!! You’ll get a single box of 38 special ammo when you order this product. 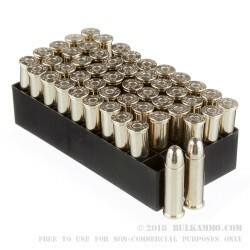 Need a lot more ammo? We’ve got you covered there and you’ll probably save another few cents per round if you go with the bulk 1,000 round case of this same exact load. You can find it for sale here.